Well, it finally came…the SOLIDWORKS World 2017 final morning session. Like many people in the crowd, I was sad it was coming to an end but excited to see the future of SOLIDWORKS. The morning started with speakers discussing everything from using SOLIDWORKS Make to designing personalized glasses to using shipping containers to grow produce. After discussing the four driving ecosystems (Design to Manufacturing, Data Management, Simulation and IoT), we got the first glance at what SOLIDWORKS' developers have in store for us in SOLIDWORKS 2018. The SOLIDWORKS team started the segment with an episode of “SOLIDWORKS Next Top Modeler," a fun way to introduce the SOLIDWORKS 2018 product features. The competition was complete with contestants and judges. 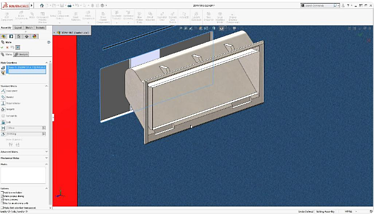 Right out of the gate, we discovered SOLIDWORKS 2018 Sketch Productivity features, like the new mirror 3D sketch, planes as symmetry reference in 2D and 3D sketch and new pen sketching on Microsoft Windows touch screen devices. That's right. Something we’ve all been trying to do with our fingers for years without the additional smudges on our monitors. How about Assembly Delighters? Would you like to see a progress bar while opening an assembly? How about twelve mouse gestures to keep those shortcuts even closer to the mouse? I personally liked the "Alt key" to hide the front face so you can select the back one without the select other command. 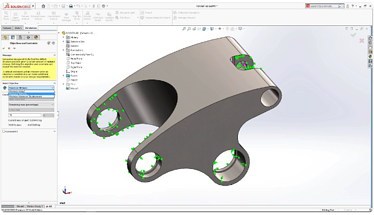 The 3D Interconnect tool was introduced in 2017, and of course SOLIDWORKS is showing off improvements for 2018. Now you can open neutral file formats and easily use them in your assembly. 3D interconnect now supports STEP, IGES, ACIS and JT files. The next contestant in the Next Top Modeler were the new tools for fabrication. Imagine making tabs and slots on your parts instead of designing fixtures to hold your metal parts together. In addition to the tab and slot self-fixturing feature for SOLIDWORKS PDM, the revision tables can communicate bidirectionally as well. Since the fields will be tied together, you no longer have to put the comments in twice. This is something SOLIDWORKS and SOLIDWORKS PDM users have been requesting for a long time. 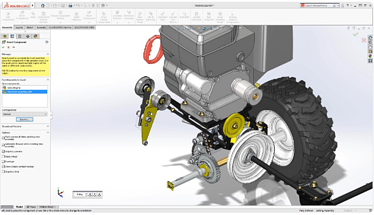 Finally, Generative Design will be added to the SOLIDWORKS Simulation family. This offers multiple objective support to help analyze a model that is feature-independent, goal-based and can have manufacturing constraints applied. SOLIDWORKS asked the audience to vote for the Next Top Modeler, and there was a tie between Generative Design and Large Assembly. The TriMech Team had so much fun at SOLIDWORKS World this year, and we can't wait to come back to Los Angeles for SOLIDWORKS World 2018 on February 4-7, 2018. Did you miss SOLIDWORKS World 2017? Let TriMech fill you in with post-event updates, including live event videos, blogs, photos presenter presentations and more! Just fill out your name and email to subscribe to our updates.